reviewed paper: Many, M.C., Denef, J.F., Hamudi, S. and S. Haumont (1986) Increased follicular heterogeneity in experimental colloid goiter produced by refeeding iodine excess after thyroid hyperplasia. Endocrinology, Feb;118(2):637-44. The authors of this manuscript (Many et al., 1986) used unbiased stereology along with autoradiography to look at microscopic changes in the hyperplastic thyroid gland of the mouse. Morphological parameters examined were percent by volume of colloid, percent by volume of the cuboidal epithelium that surrounds the colloid, number of follicles, radius of the follicular lumen, and height of the cuboidal epithelial cells. After low iodine diet, the morphology of a hyperplastic goiter was present (Many et al., table 1). Thyroid weight went up. The percent of the thyroid volume made up of colloid went down while the volume fraction and height of the cuboidal epithelium increased. Morphology returned to normal when moderate levels of iodine were reintroduced to the diet. But when rich levels of iodine were reintroduced instead, the morphology came to resemble a colloid goiter. Thyroid weight remained high, but for different reasons. The volume fraction of the colloid went up even beyond control levels and the mean number of follicles increased, while the epithelial volume fraction and height decreased. The percent of follicles that showed decreased uptake of radioactive iodine also increased as compared to control groups when the mice were reintroduced to rich levels of iodine. The methods section (Many et al., 1986, p. 638, Stereological procedure) records that all techniques were as described before in a paper from five years earlier (Denef, et al., 1981, p. 2353, Morphology and morphometric analysis, second paragraph). 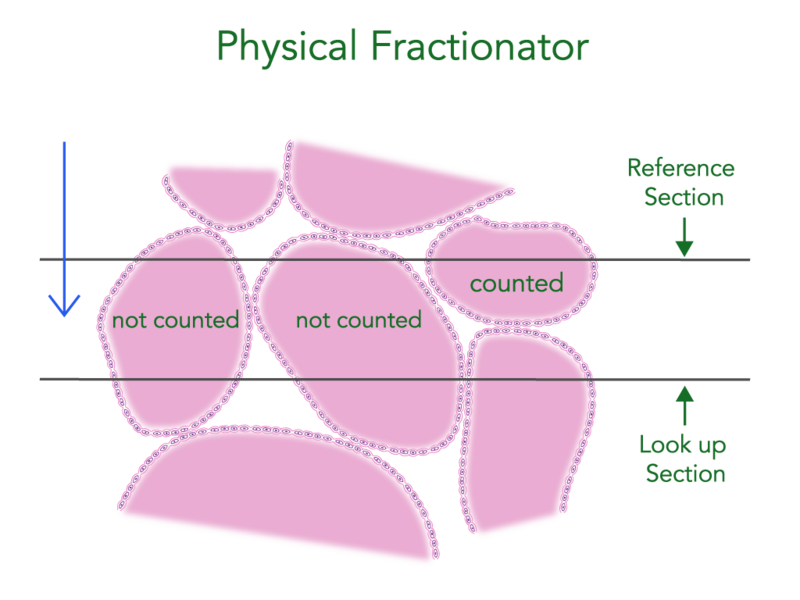 Point counting is used to estimate the volume fraction (percent by volume) of the colloid and epithelium (Area Fraction Fractionator). This probe is a well-established, good choice to use to estimate volume fraction. There is no explanation of how follicle number is estimated in either paper. Most likely, cross sections of follicles were counted. 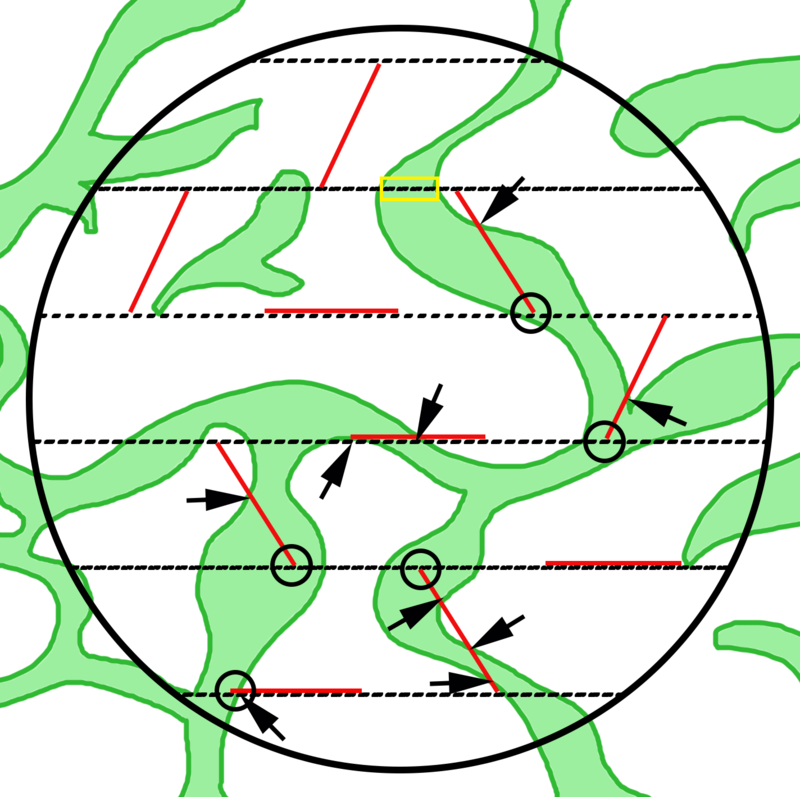 This technique, carried out on single thin (one micron) sections, is biased; a leading edge must be identified in order to count particles without bias, and therefore a three dimensional situation is required, meaning a disector must be used. To estimate the number of follicles using unbiased stereology, the physical fractionator could be used (Fig. 1). Thin contiguous sections are compared and if a cross-section of a follicle is present in the first (reference) and also in the second (lookup section; blue arrow shows direction of counting) section the follicle is not counted (two examples are shown in Fig. 1). But if the follicle is present in the first but not the second cross-section, the leading edge of the follicle has been found and it is counted (see follicle labeled ‘counted’ in Fig. 1). A problem that may arise is that there may be no way to know if the second cross section is part of the follicle detected in the first cross section or if it is part of another follicle. This is because the follicles are packed in so tightly together. 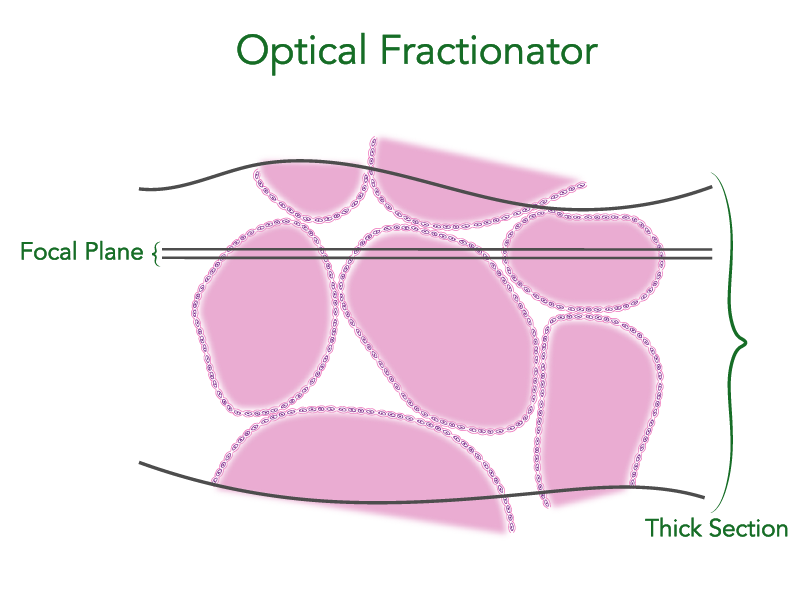 Therefore it may be better to use the optical fractionator (Fig. 2). Instead of two thin sections as for the physical fractionator, a thick section is used. If estimating the number of cells a section about thirty microns thick and an oil lens that can resolve very thin optical planes are used. For these larger particles that are much bigger than cells, a 40x air objective used on a thicker section will give a thicker focal plane (Fig. 2), appropriate for finding the tops of follicles but too thick to resolve the tops of cells. There is also no mention in either paper of how cross sections were picked for the measurement of their radii. This assay could be replaced by the nucleator that we recommend for estimating the volume of the individual follicles. The probe requires isotropic sections unless it could be shown that the follicles themselves are arranged isotropically. It needs to be used in conjunction with a disector and it can be carried out locally while the optical or physical fractionator is being used globally. Systematic random sampling is used as it usually is with all unbiased stereology probes. For a description of the technique used to estimate the height or thickness of the cuboidal cell layer, the referenced paper (Denef, et al., 1981, p. 2353, Morphology and morphometric analysis, second paragraph) refers us to a third paper (Weibel and Knight, 1964). However, Weibel and Knight give two methods in their paper; a technique for estimating the arithmetic mean thickness (Weibel and Knight, equation 13, Fig. 8, and p. 373, PRACTICAL APPLICATION OF THE MEASURING PRINCIPLES: second paragraph) and a technique for estimating the harmonic mean barrier thickness (Weibel and Knight, equation 23, Fig. 7 and p. 373, PRACTICAL APPLICATION OF THE MEASURING PRINCIPLES: third paragraph)***. The authors of the manuscript being reviewed here (Many et al.) do not indicate what method was used. We recommend using another newer method that has been used to determine membrane thickness in lung and placenta called Orthogonal Intercepts. This paper (Many et al.) demonstrates a difference between the microscopic morphology and metabolism of the thyroid gland when a low iodine diet that causes a hyperplastic goiter is changed to either a moderate or rich iodine diet. The qualitative conclusions regarding volume fraction are evident from the photomicrographs and the quantitative conclusions regarding volume fraction can be trusted to be free of bias based on the point-counting technique used (Area Fraction Fractionator). Statements regarding quantitative changes in the height of the epithelium however would be stronger if the unbiased stereological probe used was better identified. Qualitative and quantitative results regarding the number of follicles are subject to bias here, specifically over-counting, as a disector was not used (Physical Fractionator, Optical Fractionator). Denef, J.F., Haumont, S., Cornette, C. and C. Beckers (1981) Correlated functional and morphometric study of thyroid hyperplasia induced by iodine deficiency. Endocrinology, Jun;108(6):2352-8. Many, M.C., Denef, J.F., Hamudi, S. and S. Haumont (1986) Increased follicular heterogeneity in experimental colloid goiter produced by refeeding iodine excess after thyroid hyperplasia. Endocrinology, Feb;118(2):637-44. Weibel, E.R. and B.W. Knight (1964) A morphometric study on the thickness of the pulmonary air-blood barrier. J. Cell Biol., 21, 367-96. For a more modern probe that has been used to estimate membrane thickness in placenta and lung, please see Orthogonal Intercepts.